When Untuckit launched six years ago, it was hard to find a men's shirt that could be worn untucked and didn't look sloppy. Now the company is facing competition from other stores that have started to sell shortened shirts. 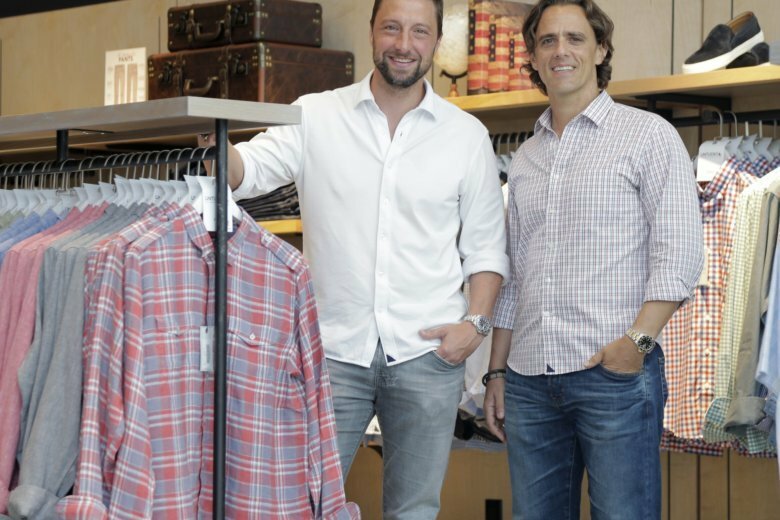 NEW YORK (AP) — When Untuckit launched six years ago, it was hard to find a men’s shirt that could be worn untucked and didn’t look sloppy. Now the company is facing competition from J. Crew, the Gap and other stores that have started to sell shortened shirts. But Untuckit is unbothered. “It actually helps us,” says co-founder Chris Riccobono, explaining that it makes more men aware of the problem, potentially creating more customers. Untuckit, which started as an online brand, will be setting up shop next to more J. Crews and Gaps. The New York company will have 53 stores by year-end and plans to open 50 more next year, many of which will be in malls. It is also expanding its shirt selection to fit more body types, like relaxed fit for beefier guys — or those who just want roomier shirts. Riccobono, as well as Untuckit co-founder and CEO Aaron Sanandres, spoke to The Associated Press recently about why it’s opening more stores and if the company’s name limits its growth. The questions and answers have been edited for clarity and length. Q: What’s wrong with just buying a regular shirt and wearing it untucked? SANANDRES: Shirts are not designed to be worn untucked. Shirttails are long. It looks sloppy, it looks billowy and it’s certainly not achieving that thoughtful-yet-casual type of look. Q: Can’t people just shorten their shirts at the tailor? SANANDRES: It never fits the way you want it to. When you shorten a shirt, it’s like everything on the shirt changes; the collar doesn’t fall the right way, the hemline doesn’t look right. RICCOBONO: I lost probably 10 shirts trying that. I wouldn’t have launched Untuckit if I was able to solve that problem. Q: Where should an untucked shirt fall? SANANDRES: Middle of the fly with a little bit of the pant pocket exposed. It’s a more polished look. SANANDRES: A month into launching we were getting emails from people saying, “Look, where can I find your shirts for sale?” And when you’re an e-commerce brand, it’s really difficult to establish the same level of trust and relationship that you can when you transact face-to-face. Stores just add to brand cachet. RICCOBONO: Our demographic is very large, from 25- to 70-year-olds. Most older men, or even middle-aged men, like to touch and feel the product. Q: How do you choose a location to open a store? SANANDRES: We look at online sales, like where our customers are. We look at Google search, where we have strong search. And then from there we start to focus in on the location. Foot traffic is important. Q: Does the name Untuckit limit you in the types of clothing you can sell? SANANDRES: It’s more a way of life. It’s that feeling when you get home from work and you untuck your shirt; that five seconds of, like, “Ahh.” It’s capturing that feeling. We have shorts, we have pants — we are a casual clothing company that extends well beyond shirts.